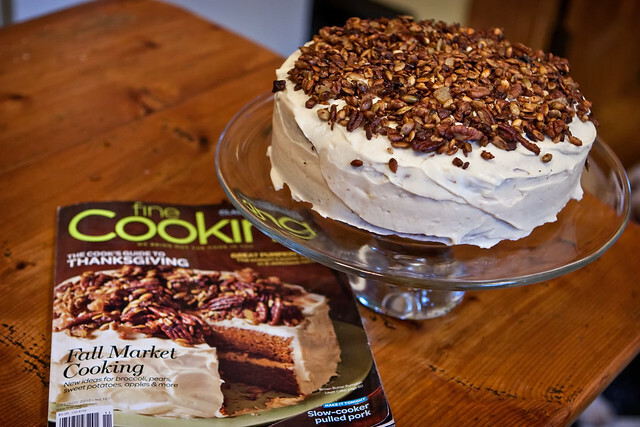 When we bought the Thanksgiving issue of Fine Cooking, we were admittedly lured in by the tasty-looking dessert on the cover. It turns out that dessert was a Brown Butter Pumpkin Layer Cake. Sounds complex, difficult, and fancy, right? Well the baking process was actually a fairly standard cake. Sure, there are some curve balls, like toasting the topping and filling and browning butter twice. Worth it. Have you ever had brown butter? It's got that sweet flavor reminiscent of caramel and not only helps cut the powerfulness of the pumpkin in this recipe, but it spices up the party and really keeps people guessing. One note on the recipe: feel free to use canned pumpkin. The cake was mostly Hanna's doing - she's always in charge of Thanksgiving dessert. Since we were pressed for time (and since I hoped that if I stuck around long enough I could lick the spoon), Molly and I offered to help a bit. The result? Amazing. Butter and flour two 9-inch round cake pans with removable bottoms (or butter two 9-inch round cake pans, line the bottoms with parchment, butter the parchment, and flour the pans). Melt the butter in a heavy-duty 1-quart saucepan over medium heat. Cook, swirling the pan occasionally until the butter turns a nutty golden-brown, about 4 minutes. Pour into a small bowl and let stand until cool but not set, about 15 minutes. In a medium bowl, whisk the flour, baking soda, cinnamon, ginger, salt, and cloves. In a large bowl, whisk 1-1/2 cups of the pumpkin purée with the granulated sugar, brown sugar, eggs, and buttermilk until very well blended. With a rubber spatula, stir in the flour mixture until just combined. Gently whisk in the brown butter until completely incorporated. Divide the batter evenly between the prepared pans. Bake the cakes until a tester inserted in the center comes out clean, about 28 minutes. Let the cakes cool in the pans for 10 minutes. Turn the cakes out onto racks, remove the pan bottoms or parchment, and cool completely. Melt the butter in a heavy-duty 12-inch nonstick skillet over medium heat. Add the pecans and pepitas and cook until the pecans brown slightly and the pepitas begin to pop, about 2 minutes. Sprinkle in the brown sugar and salt and stir until the sugar melts and the nuts are glazed, about 2 minutes. Stir in the ginger. Remove from the heat and let the mixture cool in the skillet. Melt the butter in a heavy-duty 1-quart saucepan over medium heat. Cook, swirling the pan occasionally until the butter turns a nutty golden-brown, about 4 minutes. Pour into a small bowl and let stand until the solids settle at the bottom of the bowl, about 5 minutes. Carefully transfer the bowl to the freezer and chill until just firm, about 18 minutes. Using a spoon, carefully scrape the butter from bowl, leaving the browned solids at the bottom; discard the solids. Using an electric mixer, beat the butter, cream cheese, and brown sugar on medium-high speed until light in color and the brown sugar has dissolved, 2 minutes. Gradually beat in the confectioners’ sugar and continue beating until fluffy, 1 to 2 minutes. YUMMMMM!!! This looks and sounds amazing...thanks for sharing. Can't go wrong with brown butter. This will be my next snow day project!